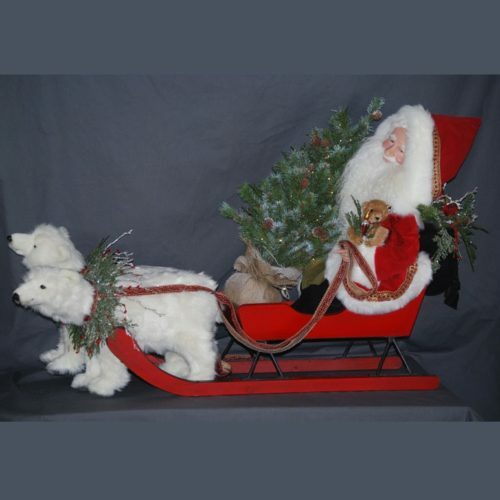 Almost Heaven is a wondrous Woodland Santa figure, riding on a wooden and steel sled. This one-of-a-kind Santa is lovingly sculpted with polymer clay so that his face is truly unique. 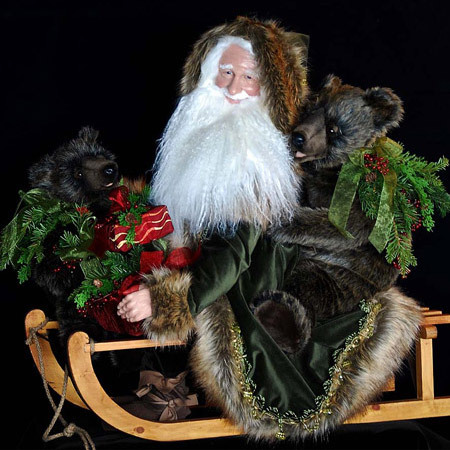 A serene and handcrafted collectible Santa, Almost Heaven is dressed in dark forest green velvet with beautiful faux fur and gold and crystal trim. His boots and cummerbund are created with dark brown pig suede. His beard is Tibetan wool and is signed and dated on the underside. 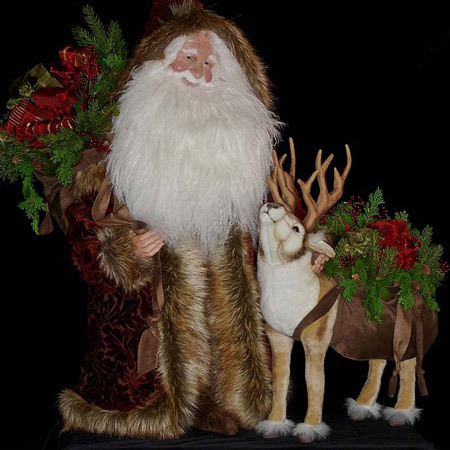 This is a large Santa, and the collector will want to provide him at least a four-foot by four-foot space so that he can be fully appreciated. 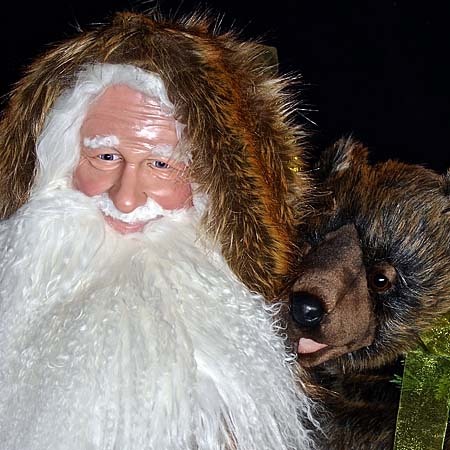 He is accompanied by two lifelike, handcrafted grizzly bears, one large and one small. 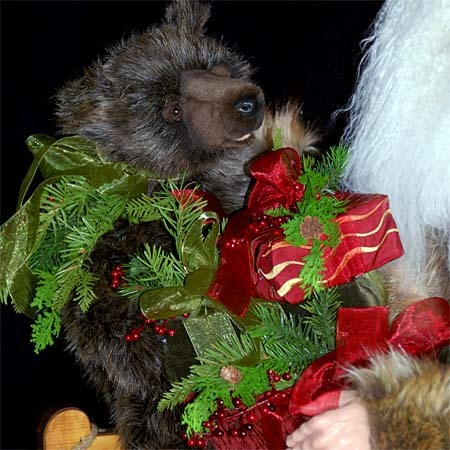 Each bear decorated with greenery and berries. In Santa’s lap, you will find a selection of heavenly packages, wrapped with delightful fabrics and organza ribbons. This exquisite Woodland Santa might just replace one of your Christmas trees! To learn more about Stone Soup Santas or purchase a Santa, please give us a call at: (415) 927-3527. 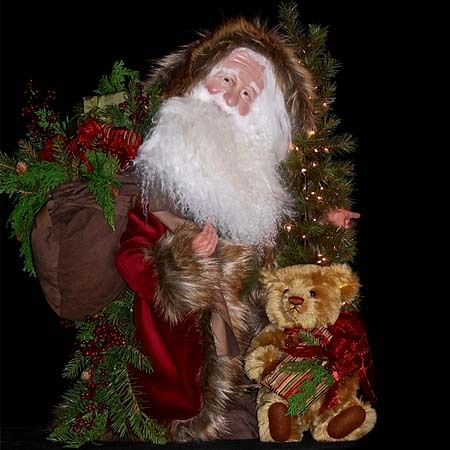 Stone Soup Santas creates collectable handcrafted Santa figures, with joyful, lifelike faces. Every Santa is signed and dated by artist, Shelie McCall.